Chenoweth Lane, running from Brownsboro Road into the heart of St. Matthews, is an idyllic little lane. Lined by mature trees and quaint, well-kept cottages, it’s a reasonably calm, but busy, two-lane street. And, despite a fragmented set of sidewalks, it’s a walkable neighborhood, as evidenced by a healthy amount of pedestrian activity on any given day. There’s even a marked crosswalk near the northern terminus, for goodness’ sake! On Wednesday, January 13, concerned neighbors held a public meeting at the St. Matthews Community Center to discuss those proposed changes to the corridor, and representatives from KYTC didn’t show up, despite an invitation. 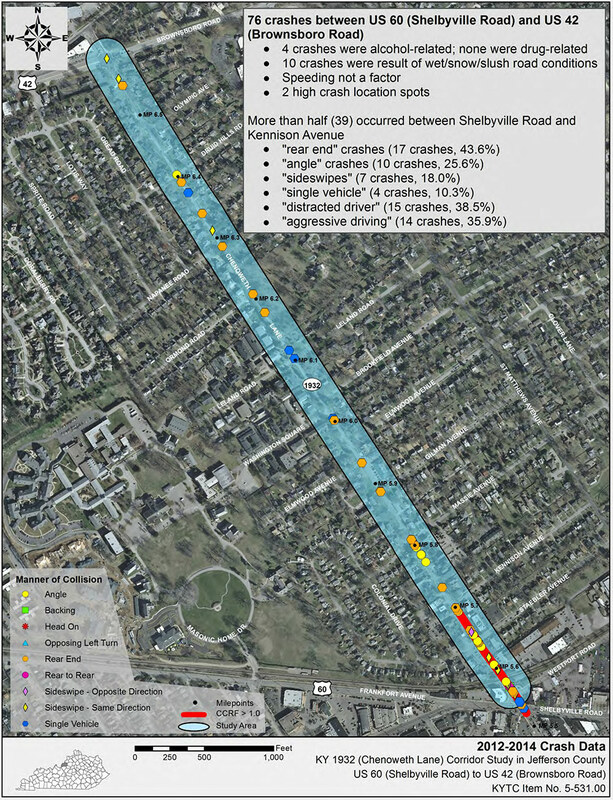 Yet, while mode choice along the corridor is indeed limited, KYTC’s own collision data, traffic counts, and projections do not support a need for increased vehicle capacity or other car-centric modifications. Appropriately, then, KYTC does present a “no build” option. And yet, the option of adding a third (center-turn) lane remains a prominent aspect of the study, accompanied by a variety of a la carte configurations of bike lanes, shared-use paths, and additional sidewalks. But each of these configurations, either with or without the third lane, has a major drawback that many fear is apt to hinder as much as help pedestrian and cyclist safety and multi-modal transport. And is certain to diminish the charm of the corridor itself. 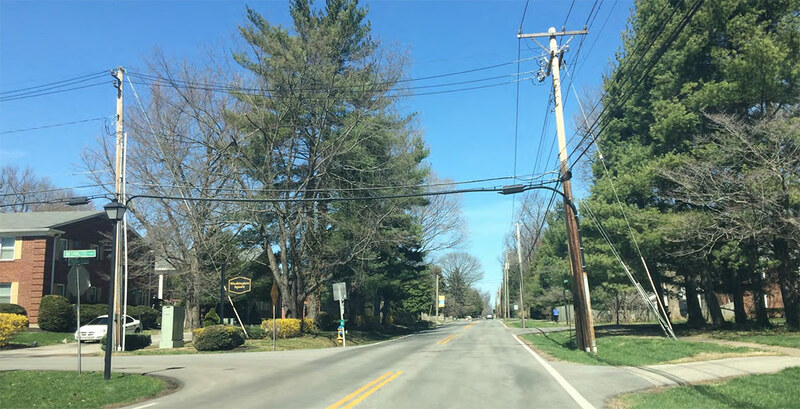 Indeed, any improvement also provides an opportunity for KYTC to remove what it considers hazards (and others might consider traffic calmers): streetside fences, stonework, utilities, and mature trees. The result is a far wider “clear zone,” creating a visually and physically widened corridor, which, in turn, promotes increased traffic speeds and decreased safety and livability for all other users and residents. 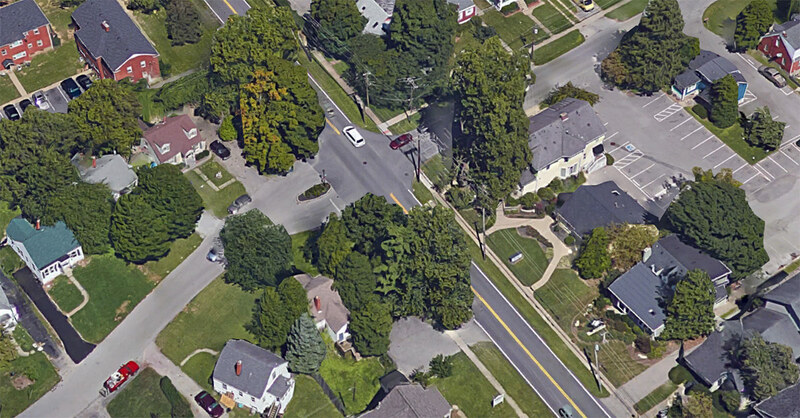 These implications are not lost on over 600 petition signatories and the grassroots effort called STOP the Widening of Chenoweth Lane, a group that has launched a strikingly effective defense on this particular front in the larger battle to preserve and/or reclaim a more people-centric version of Louisville’s streets. During an evening meeting held at St. Matthews Community Center on January 13, approximately 50 citizens—with just a single “pro-progress” dissenter in the ranks—listened to a well-researched and well-reasoned presentation. 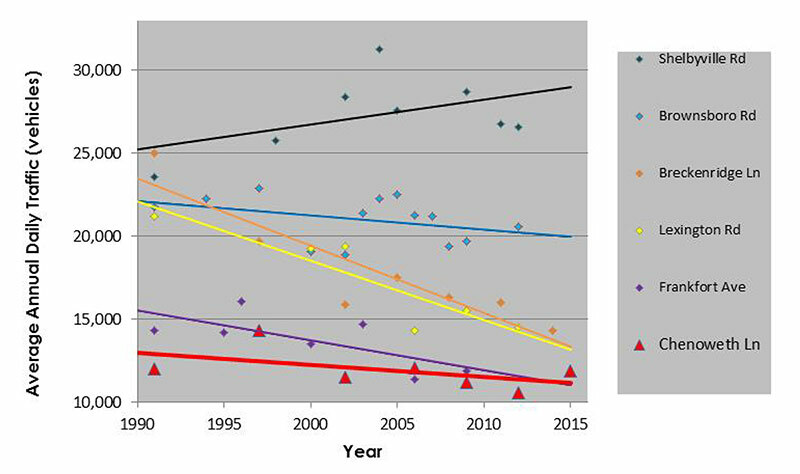 KYTC’s data showing decreasing traffic count projections, relatively few fender-benders, and an acceptable level of service (even at peak hours!) were employed to make a compelling case for scrapping a three-lane proposal. The issue of peripheral improvements—completed sidewalks, bike lanes, shared-use paths, drainage upgrades, ADA-compliance, and other pedestrian amenities—also were addressed. Despite favoring several of these features, STOP has taken the position that any intervention by KYTC is unwelcome. Bike lanes are specifically opposed for Chenoweth, which did promote some discussion and disagreement. Included in the discussions were State Representative Tom Riner (D-41), State Senator and Transportation Committee Co-Chair Ernie Harris (R-26), who fielded questions, and Councilman Bill Hollander (D-9), who made remarks following the initial presentation. In addition, mayors and representatives of several of the surrounding small cities, including Rolling Fields, Druid Hills, and others, were in attendance. Interestingly, officials from larger surrounding cities—most notably, St. Matthews, but also Indian Hills—were neither present at the meeting, nor have taken a position. 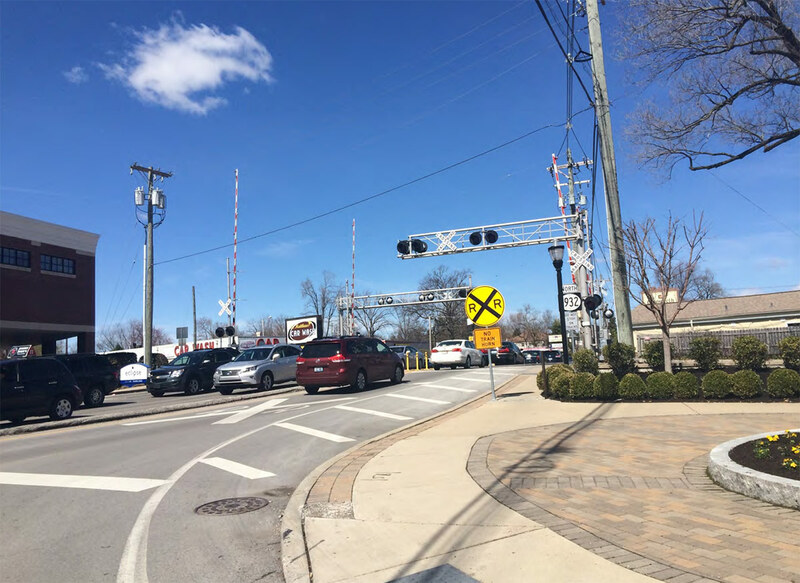 It’s been suggested that opposition from the latter may have contributed to the abrupt cancellation of the Brownsboro Road diet extension, based upon car commuters’ throughput concerns. 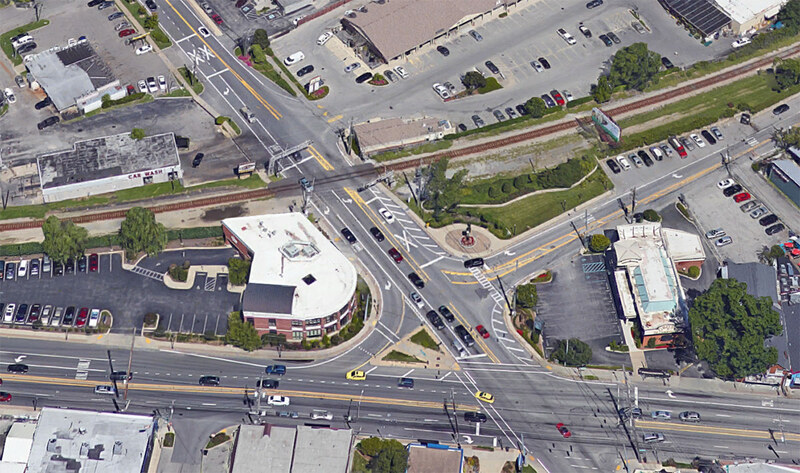 As the Chenoweth Lane proposal addresses the same issue, one might be reasonably curious about their stance on the proposal. The most notable absence at the January 13 meeting was the Kentucky Transportation Cabinet. Their office reportedly declined an invitation to attend. However, a follow-up call to Judi Hickerson, of KYTC District 5 which covers the Louisville area, confirmed that another KYTC-sponsored Public Input Meeting will be scheduled for late February 2016. Subsequent to completion of the current Planning Study, a Final Study will be released in late summer 2016. Were an option other than “no build” chosen, the project would then enter Phase I design. More information regarding the project, including contact information for governmental officials, may be found at STOP the Widening of Chenoweth Lane’s Facebook page, and at KYTC’s document from its November 2015 informational meeting, here and here. You can also read up on previous Broken Sidewalk coverage of the project here and here. [Top image of Old Staebler Avenue at Chenoweth Lane facing west, showing Colonial Village, circa 1942, courtesy St. Matthews Historical Society / KYTC. There were two representatives from the City of Rolling Fields. Furthermore, the City of Rolling Fileds unanimously passed a resolution opposing any widening of Chenoweth Lane. Judy Edwards- Thanks for a great article, with only a couple of updates. As Dan Tafel has said, the city of Rolling Fields was very supportive. They passed a unanimous resolution against the proposal, had representatives at our meeting, plus, Tafel (a Rolling Hillis resident) is a member of the Stop the Widening of Chenmoweth Lane committee. I also question your count of the number of people at the meeting. There were 150 chairs set up and a great deal of them were filled. Thanks for your great article. Yes, the city of Rolling Fields was represented and we had more than 50 in attendance. It was a great meeting. Well researched, as you said. We have many more people involved behind the scenes supporting this initiative who were unable to attend that particular night. The information regarding Rolling Fields is being corrected as we speak. Several attempts were made for clarifications from the STOP organization, but were unanswered. Please accept my apologies. Please remember this is a state road issue. Bicycles are considered to be vehicles (http://transportation.ky.gov/Bike-Walk/Documents/Bike%20Law%20Brochure.pdf), those that likely don’t obey the law. I support the beautification, widening (to an extent not to invade the property owners existing property line – all new work to be completed in the existing ROW). Thus leading to a compromise between the independent cities, state and property owners. Would it help if bicycle traffic was indicated with signage, signals and hours of operation? Walkers deserve a safe path to commute or exercise, but not a shared path with bicycles, which is illegal at the city and state level (bikes are considered vehicles (State) and “no person over the age of 11” is permitted to operate a bike within the Louisville Metro City limits, either way these laws are never enforced, but if they were there would be a greater outrage because they never have. Either way, the state has a master plan and no open to opinion. The best result will be the best compromise. Understand the requirements of the state, they are required to have public meetings, but not required to attend meetings sponsored by the public. Bicyclists are treated like garbage in Louisville, let alone in the state of KY. It is just not considered an upstanding mode of transportation. Only poor people ride bikes, or health freaks, or, ugh, environmentalists. And they are so preachy too, always whining and complaining, gimme gimme gimme. Cyclists are just not worthy of consideration. It’s irrational. At most, a cyclists poses a slight inconvenience to a driver. Not even a big inconvenience, just a small one. Maybe a driver needs to slow down a little, and wait a few seconds to pass. That’s in the worst case scenario. But that’s considered too much. An inconvenienced driver is an angry driver, no place less so than in Louisville. Drivers are also fearful. what if I hit the cyclists, he’d be really hurt wouldn’t he? Well, you are operating a 3000 pound high-speed machine, you should wield it responsibly. Also, don’t worry, you can run somebody over in Louisville no problem, it’s an accident after all. plus, he probably had it coming too, wearing dark clothing, biking at night. tsk tsk tsk. Cyclists need separate lanes wherever possible, especially on larger avenues. There is no practical reason that a street as obnoxiously wide as Chenoweth could not accommodate two separate cycle lanes. It’s purely due to that irrational distaste that the majority of Louisvillians have for people on bikes, that there is opposition. Cyclists pose only a slight inconvenience to motorists? Cyclists are hypermoral social anarchists, willfully disobeying multiple rules of the road, or else taking over the road entirely, and often times riding at night wearing dark clothing with no headlight or tail lamp. Then when some poor motorist accidentally strikes a cyclist, the headline reads “Lazy, greedy, fat, suburbanite motorist runs down cyclist in a brazen act of sociopolitical subjugation”. Jus’ sayin’. Great headline 🙂 But that headline (or a less amusing version) has never ever been written in a KY newspaper. The headline is: “cyclist struck by motorist”, and the byline is something along the lines of “cyclist was wearing dark clothes”, or, “accident happened at dusk, driver blinded by glare” , “or, cyclist was turning left, not wearing a helmet”, … and that’s about it. While sad, the cyclist really had it coming, and will somebody please think of the driver because he has to live with this tragedy too you know! Oh, and let’s not forget, the end of the report usually ends with a reassuring “road is cleared and opened again for traffic”. And yes, cyclists inconvenience drivers, and that is why drivers resent them. Cyclist do not endanger drivers. How could they anyways, a drivers sits in a metal box. how many drivers have been injured or killed due to a cyclists in KY? none. Cyclist do not endanger motorists. But they are an impediment..and whatever they do, it’s never OK. Riding on the sidewalk because the road is dangerous? assholes because they don’t respect pedestrians. On the road instead? assholes because they slow down traffic. Demanding a separate bikelane? NOT WITH MY TAX MONEY! Making a rolling stop at an intersection with no oncoming traffic? assholes because look at them flaunt their disregard of the rules. People in louisville dislike cyclists, but it’s not because they have an averse affect on traffic flow. It is also not because they are a menace and are injuring people left and right. It also really is not about breaking the rules in principle. People break the rules all the time. Does every driver use their blinkers when changing lanes? rarely. Does every motorist obey the speed limit? rarely. Does everybody wash their hands after peeing? better not know the answer. It really isn’t about the fact that cyclists break the rules, that’s a kludge. It is about WHO breaks the rules. So who rides a bike in traffic in Louisville? there’s the people not worthy of our consideration: indigents, homeless people, drug dealers, loitering teens. Who else, let’s see: those obnoxious hipsters and yuppies, probably living in the highlands or where ever’s trendy now; oh yeah, there’s that old man, isn’t there, i saw him in the newspaper once, a professor or something, but he has money, so let’s call him eccentric. oh yeah, these spandex wearing pudgy middle-aged men on Sunday morning on river road. And that is it. that’s pretty much 90% of the population in Louisville that never bikes in traffic. And with reason! roads are made for cars in Louisville. And drivers drive accordingly. Better not risk it. But would drivers be so indignant if their spouse biked to work? What if their children would use it to go to school? the conversation would be completely different. Instead, there are tens of thousands of families in louisville where NOBODY rides a bike. that explains the enormous lack of empathy to cyclists in this city. once people have loved ones riding their bikes on louisville’s streets, understanding and empathy follow automatically. A positive note: It’s getting better. many other cities in the country start to understand that good mobility requires options. The cities leading the way now are the aspirational cities, but eventually louisville will follow. Compared to ten years ago, there’s a lot more cyclists in louisville. One can only hope that ten years from now there will be even more. And hopefully by that point, drivers will have let their anger go. it’s hard to stay angry for a long time. people can nurture it, they can rationalize it, but being angry is exhausting, it takes something from you. Eventually, there’s acceptance. it’s human nature. One more positive note: Louisville, by and large, has sensible cops. They can read a situation well. They won’t pull over a driver for going five mph over the speed limit, or for not using blinkers. Likewise, they’ll tolerate cyclists on a sidewalk when the road is obviously dangerous, or for making a rolling stop. if only the rest of the motorists had the same patience things would get much better much quicker.